This a pay your own way event. This means even me the organizer pays my own way to attend. Organizing drives is my hobby and I enjoy organizing and hosting events for fellow enthusiasts. I pay for the website and store system out of my own pocket to make sharing information and registering easier on everyone. 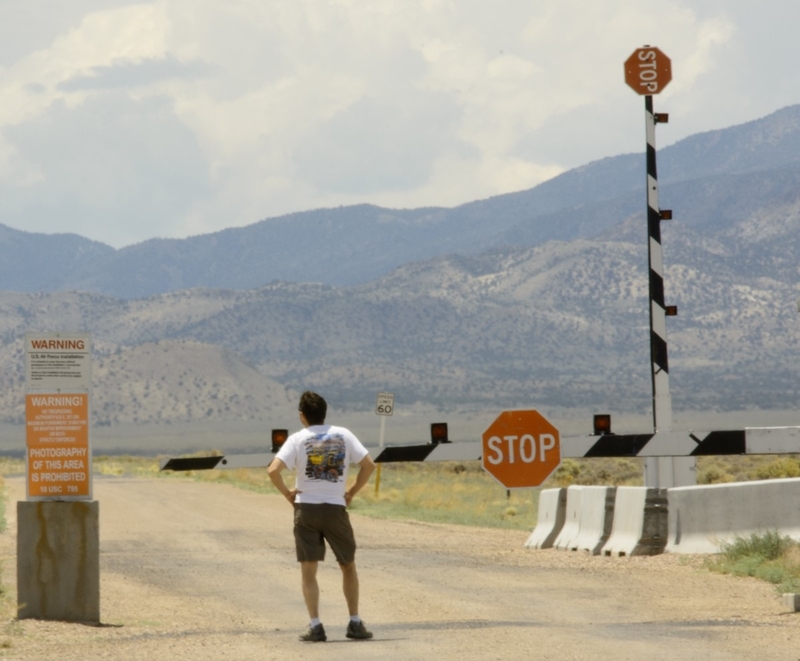 Ever wanted to see the famous sights around Area 51? This is the trek for you. We will be doing a two day trail tour to see all the sights and maybe a UFO or two around Area 51. Open to any and all vehicles, this will be a fun two-day adventure that loops from Tonopah to Vegas and back. Our trail runs are planned around having fun, seeing sites, and traveling specific amounts of mileage per day / event. This means if you participate, you are aware of the mileages needing to be covered per day and that you are expected to cover them in a reasonable time frame. Our group is NOT a "fly as fast as you can" group, but at the same time we are not a crawler group. We enjoy offroading with all types of trucks/SUVs , therefore the routes and daily mileage requirements are selected with non modified 4X4 vehicles in mind. 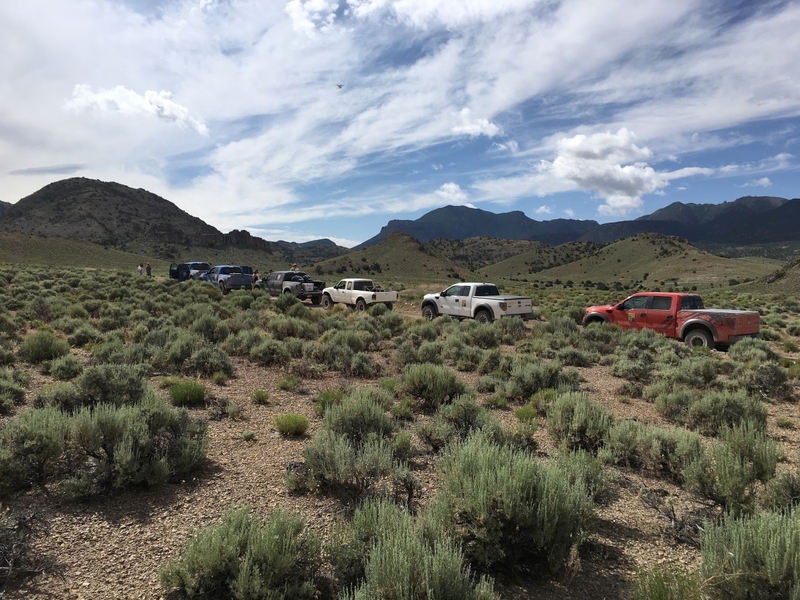 By signing up, you understand we ask that when the trail conditions allow, you drive at a safe pace that can allow you to cover the terrain / distance as expected by the group. Starting in Tonopah, NV, we will head south along the border of the Groom Lake test range, AKA Area 51. Day 1 will be the sightseeing day to make stops at the usual tourists' stops: the “black mail box”, Little Alie-Inn, and Groom Lake Road Gate, to name a few. There are a few other stops planned for those in attendance to get out and stretch and maybe see a UFO.. or two. The end of the day will be in Las Vegas, NV for the overnight stop. Day 2 will lead back to Tonopah. The stops will be at Devils Hole and a few abandoned mines that are on the way. $110 - Covers Decals, Event Insurance, PayPal. Optional items you can chose from upon registration are boxed lunchs for each day for Subway and Wholefoods. For those who would like a more relaxed start for the weekend’s activities, we have arranged a group rate at the Best Western Tonopah right by the starting point. This will allow those of you who are coming from a distance to have a place to rest and relax before a weekend on the trail. Day 1: Meeting Location - Driver meeting, meet up. Depart: 8:00am – Trip begins. A drivers’ meeting will be held to go over the rules of the trail as well as make sure everyone has the required gear. This is also a chance for participants to ask questions and get assistance on any part of trail setup. This day has a more casual feel than the day before. While we are covering the same amount of trail miles, the biggest difference is we are making stops for fuel and restrooms at small towns vs. being out on the trail the entire day. After lunch we will make the final push to Tonopah. 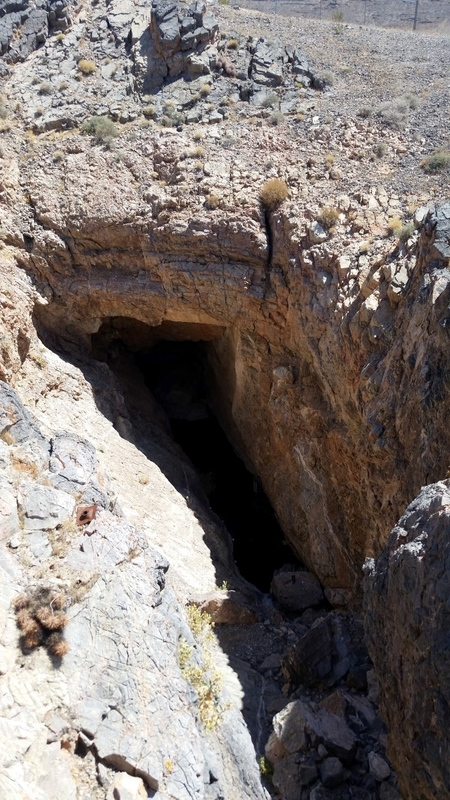 Here we will see a few ghost mines and explore a few geological formations. To register for this event please use the following link to register. Again this is open to any and all offroad vehicles and skill level. When you hear about a trip to Area 51 you image strange and abnormal things will happen. Well, this expedition was certainly one of those tales. Saturday morning the group met to go over the day’s activities and the usual safety brief of, “take it easy.” The morning was cold and overcast, which was nice as it was 98 degrees on the drive in the day before. First stop for the day was the old airfield where they flew some of the X programs. You could drive into one of the hangers and get pictures. From the hanger it was an adventure trail (very faintly visible) to the next trail section. 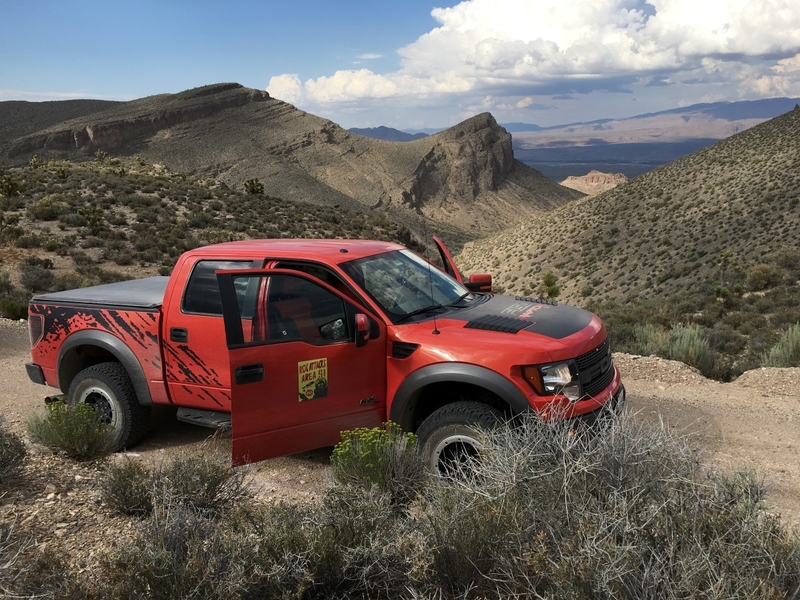 Most of the group made good time but several participants were new to offroad, including the Lexus and rental Expedition, so they were learning what the vehicles could do. And yes you read that right, more on that in a minute. The next section was all about cruising. Trail was smooth and in better shape than most CA freeways, sadly. As we got closer to one of the mountain ranges we turned to the side trail and went into a great canyon section. This was tight and felt like a world rally stage. Once we got to the other side of the range, the trail opened up into a LONG straight trail. It was about 10 miles of dead straight and flat trail before a turn. On this section we had some fun rollers that made for a few laughs. When we got near the end of this section we had some right turns. One of the trucks missed a turn and had a catastrophic failure. 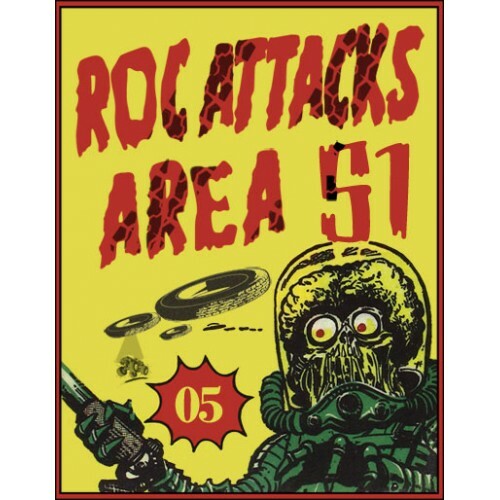 Now here is where the Area 51 oddities start. We will have two stories for this day. First story will be of the main group. While I helped the driver and passenger of the broken truck, the main group went on. 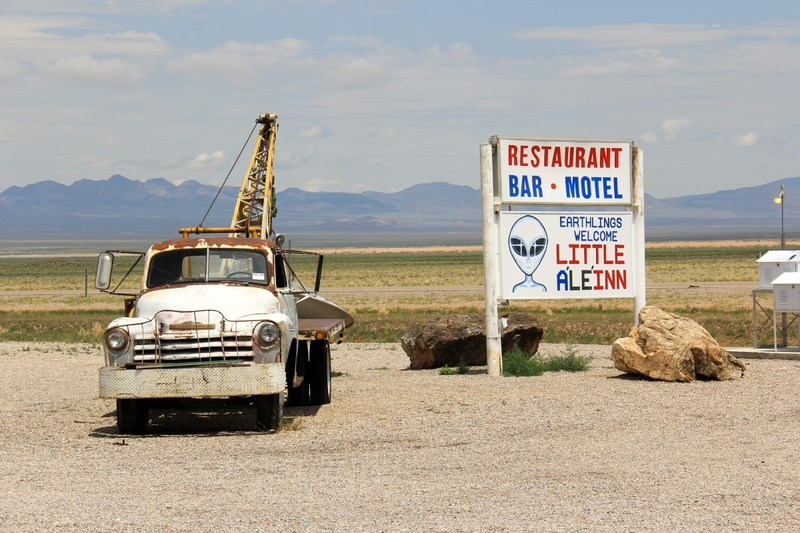 They made stops at the Little Alien Inn, area 51 main gate (no one arrested), Petroglyphs, Alien science and off to Las Vegas. Everyone was making good time, even the Lexus and Rental were both were doing ok. The new Raptor owner was the boat anchor and delayed the group here and there, as he too was learning what his vehicle could do. The last section of the day is where all three owners got a fast introduction to expedition off roading. The Lexus and one of the Raptors blew a tire here and the Expedition got a dinged running board. Now to other day’s story. After transporting the driver and passenger of the truck to Las Vegas, myself and the driver picked up a flatbed trailer and a second truck and went back the 160 miles to where his truck was left. On the way there we go drenched from a thunder storm. 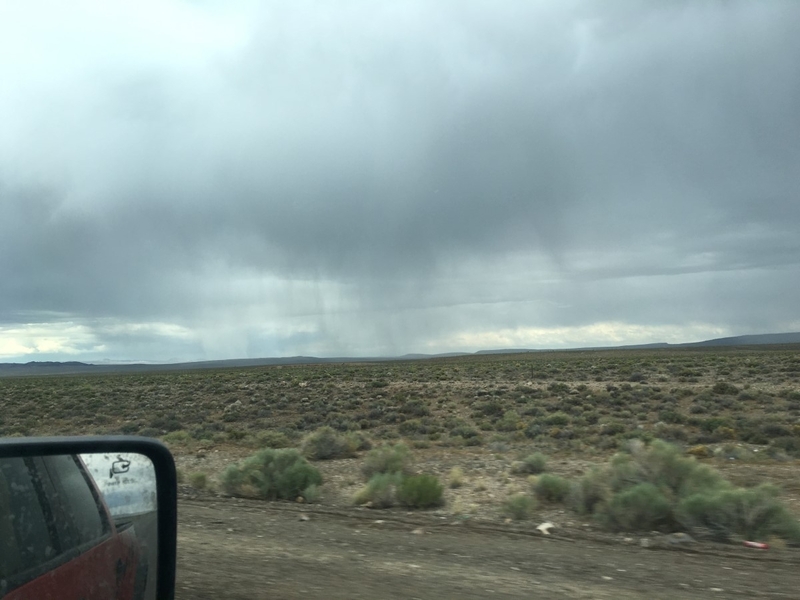 Then, as we approached Rachel NV, we got snowed on, and then as we got to the truck we had sunshine again. As we recovered the vehicle there were 2 massive thunder storms approaching us. This brought the outside temperature down fast and it became windy as hell. When the storms were about 20 miles away, as if the aliens were giving us a hand, the storms split and went around us. The wind died down and temps stabilized. You could see clear skies above us and lightning all around us in the distance. After dragging the truck onto the trailer and hitching up, we drove another 160 miles back to Las Vegas. We arrived to the hotel at midnight. On day two the group was smaller. 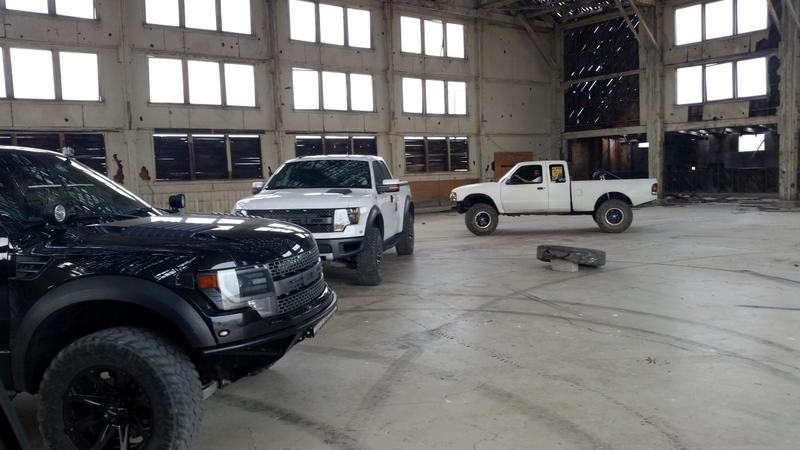 The Lexus and Expedition bowed out and one Raptor slept in. The group left at 8am on the dot to hit the trails. 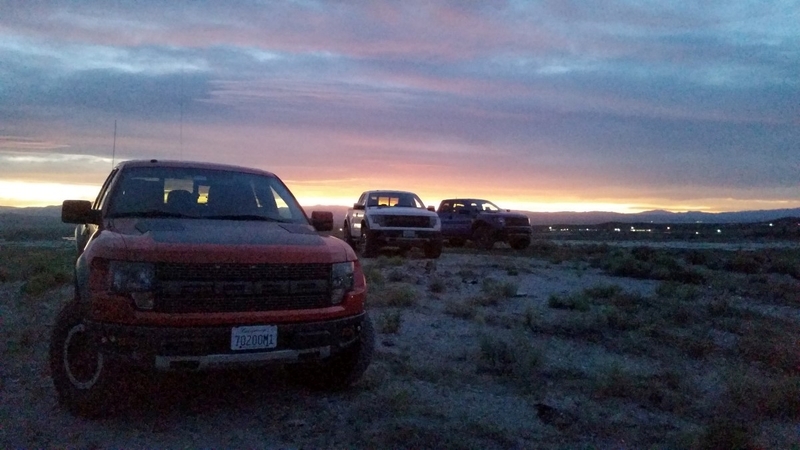 The group, which now consisted of all Raptors, drove the 40 miles to the trail start. With the memories of Saturday still in everyone’s mind, radio and adherence to safety were being strictly followed. At the start of the trail it was sunny and 85 degrees outside. We made fast time over some of the best trails of the trip. We stopped at a lake bed for some photos and fly byes. From the lake bed we made a stop at Devil’s hole and headed to Beauty. The two sections of trail we had not pre ran were skipped, as the start to one of them was completely gone. 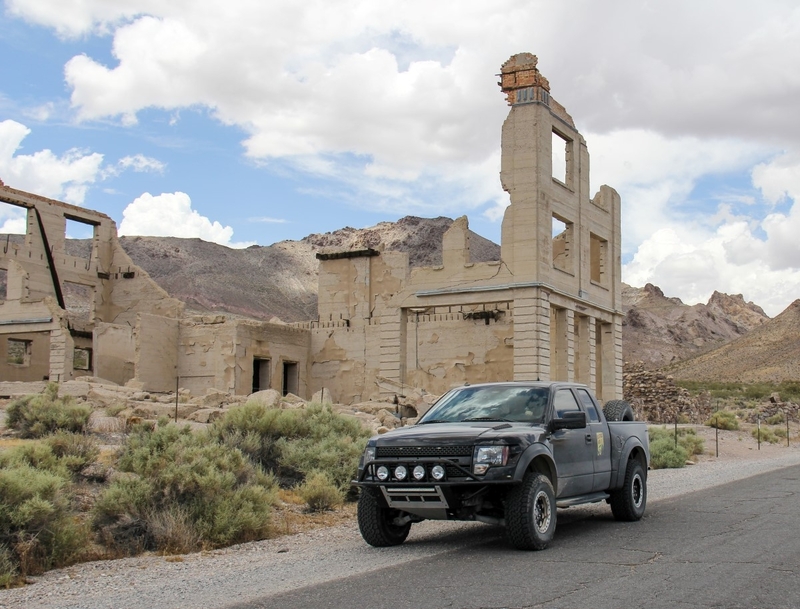 After fuel and lunch in Beauty, we stopped at Rhyolite for pictures and made our way through Death Valley. As we approached the Limpcot mine stop, the strange started again. During the last 2 miles of this section a massive thunder storm rolled through and left 2 inches of water on the lake bed we were traveling on. This made for an adventurous section, as if you traveled too fast you would get blinded, and if you traveled too slow you would get stuck. By the time everyone made it to the mine, the temperature dropped and you could see another massive storm coming in the distance. As we had several canyons to run down, it was agreed to call the event for safety concerns. We had covered ¾ of the distance back to Tonopah and it was not worth the risk. Everyone aired up and started back to Tonopah. On the way there the storm hit and it came down in BUCKETS. Shortly after, hail was added to the deluge. Temperatures dropped from 85 degrees to 31 degrees in a matter of a minute. It took us over 10 minutes of driving on a freeway to get to the edge of the stop. If this had been on the trail it could/would have been hours and caused a serious risk to the group. The right call was made. This was one wild and crazy weekend, as the weather and events made it go all sorts of directions. We will be planning in the future to re-run the trip, hopefully with no spooky or crazy events.